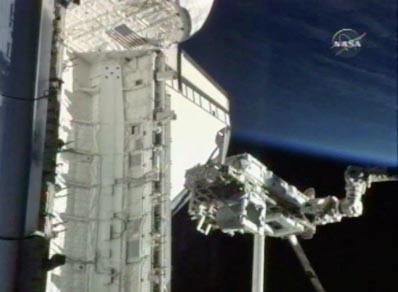 Astronauts Piers Sellers and Garrett Reisman, operating the space station's robot arm, moved a cargo pallet loaded with old solar array batteries back to the shuttle Atlantis' cargo bay Saturday for return to Earth. Working at the robotics work station inside the station's multi-window cupola, Sellers and Reisman began moving the integrated cargo carrier, or ICC, back to the shuttle just after 4:30 a.m., completing the operation at 5:50 a.m.
For launch, the ICC was loaded with a backup Ku-band dish antenna, an 8-foot antenna boom, an equipment storage platform and six new batteries to replace outdated power packs in the station's far left solar array. The antenna, its support boom and the equipment platform were moved to the space station during a spacewalk Monday. The new batteries were installed during spacewalks Wednesday and Friday and the old batteries were bolted to the ICC for return to Earth. "Today the crew completed all of their primary mission objectives with the return of the integrated cargo carrier and the six old batteries from the port six location of the International Space Station's power channel," said shuttle Flight Director Mike Sarafin. "So we've got the integrated cargo carrier back in the payload bay, we've got three very successful spacewalks under our belt and the (Russian) Rassvet module has been installed on the International Space Station. So now the mission shifts to returning Atlantis home, hopefully mid next week." After answering video questions from school kids at 7:40 a.m., the combined 12-member shuttle-station crew shared a joint meal before the Atlantis astronauts enjoyed two and a half hours of off-duty time starting at 11:05 a.m. Crew sleep on tap at 4:50 p.m.
Atlantis is scheduled to undock from the International Space Station around 11:22 a.m. Sunday with landing back at the Kennedy Space Center expected around 8:48 a.m. Wednesday, weather permitting. Sarafin said the 132nd shuttle mission had been conducted in near flawless fashion with only a few relatively minor glitches. He called attention to a complex set of robot arm procedures using a work station in the station's new multi-window cupola for the first time. "All the robotics that we worried about leading into this mission were just handled in an exception manner," he said. "Coming into this mission, we talked about nine of the 12 days of this mission were populated with very heavily integrated and choreographed robotics activities. "Today, the crew of Atlantis and the International Space Station took a few moments to compliment the folks who helped plan all the robotics on this mission as well as the folks who built and delivered the cupola and the robotics work station associated with it. And I'll just second their words that all of that was done in an outstanding manner. "Canadarm 2 performed in a fantastic fashion," Sarafin said. "It was all over the exterior of the International Space Station this mission, it was reaching down into the payload bay to remove cargo as well as put it back, it moved from the center of the truss back to the Russian segment, over to the port side of the truss and then back to the center of the International Space Station. Again, it was just an outstanding piece of machinery."